M. Kent Olsen is the founding partner of the Law Offices of M. Kent Olsen, who specializes in estate planning, estate and trust administration, estate and trust litigation, guardianships and conservatorships, advanced medical directives, individuals with disabilities, and elder law. Mr. Olsen was Referee of the Denver Probate Court for six years prior to founding Olsen & Traeger, LLP. Mr. Olsen is a member of the Colorado, Denver and American Bar Associations, as well as the Denver Estate Planning Council. 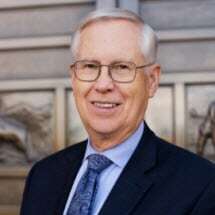 As a long-term member of the Trust and Estate Section of the Colorado Bar Association, Mr. Olsen previously served as Chair of the Section, Chair of the Rules and Forms Committee, Column Editor for The Colorado Lawyer - Estate and Trust Forum, and Co-Chair of the Protective Proceedings Act Subcommittee; at this time, Mr. Olsen continues as a member of the Statutory Revisions Committee. Mr. Olsen was an appointed member of the Governor's Commission on Life and the Law. In addition to being a former instructor for paralegals and a member of the advisory board of Denver Career College, Mr. Olsen is a frequent author and lecturer on probate, estate litigation, disabilities planning, health care treatment, protective proceedings, legal ethics, and issues on aging. Mr. Olsen is President and a founding member of the Colorado Fund for People with Disabilities, Inc., a pooled Medicaid trust; a past President of Advocacy Denver, an advocacy organization for people with developmental and intellectual disabilities; and a Board member of Arc of Colorado. Mr. Olsen's name appears in Who's Who in America, Who's Who in the World, and Martindale-Hubbell's Bar Register of Preeminent Lawyers. Additionally, Mr. Olsen has been named as a Colorado Super Lawyer since 2006.